Last month, I shared a post about how the homeless often get short-changed when it comes to accessing resources (books, computers, etc.) at public libraries. I was inspired by a piece by Kelly Jensen over at Book Riot about how an initiative to get free e-books into children's hands is ignoring a significant segment of the population—namely, the poor and/or those without Internet access. I was surprised and delighted to find out from some commenters that there are libraries out there that do offer services to homeless patrons, and I also learned a little more about the various legal and fiscal roadblocks libraries can run into when they attempt to create lending systems and programming for underprivileged populations (e.g., less accountability for missing materials, resource licensing, and more). I know that policies and programs vary widely by state (and probably even county), and I really appreciated everyone who took the time to weigh in! When you're homeless, you often aren't having your basic needs met; the hundreds of calls I fielded during my internship at a homeless hotline made this obvious. Seeking out food and shelter is important, of course, but when your homelessness is chronic, you need pockets of time spent doing things other than surviving. I think a recent photo set from National Geographic perfectly captures this sentiment. The magazine published a series of portraits by Fritz Hoffman of homeless library patrons reading in libraries throughout the state of California. Some of them are reading to learn; maybe what they learn will be directly applied to improving their situation (i.e., finding steady employment), but many of them are diving into fiction, lighter non-fiction, and religious texts. They're doing what so many of us do on the weekend or after a long day: they're diving into a good book and losing themselves in it. While I was never homeless as a child, I was more than once displaced. After my parents separated when I was 14, my mother and I got evicted from our new apartment. We spent months sharing a makeshift bed in the living room of my best friend's home, and after her (my best friend's) parents separated as well, all of us (my best friend, our two moms and I) rented a house together so she and I could finish out our junior and senior years of high school. Even before my parents split up, I was dealing daily with substance abuse, verbal and emotional abuse, and chronic depression in my household. Throughout it all, books were my sanctuary, my lifeline, the places I could escape into (Hogwarts, Constance Billard School for Girls, the "territories" of the Travelers) and have the chaos around me melt away. Sometimes I even dove into bookish chaos (à la Chuck Palahniuk and Bret Easton Ellis) because it was more manageable than my own. I could always shelve the book in a way I couldn't shelve my reality. I do not mean to fish for pity or to say I've had the hardest childhood in history, but these are the facts. I know what I went through, and I know what helped me endure it. It can be easy to dismiss books as a luxury that the homeless, poor or otherwise struggling wouldn't be able to take advantage of anyway—with all that surviving to do, who has the time? But everyone should be given the opportunity to do more than just survive. Have you ever used books to escape a particularly hard time or situation? Thank you for writing this post - homelessness is a cause close to my heart (as are libraries!) and it was so interesting to read about that intersection. I also "dive into bookish chaos" occasionally, as you so eloquently put it - and it's exciting to see that someone else does the same! For years, I've returned to Robin McKinley's Deerskin, which deals with some serious trauma (great book, but DEFINITELY do some research before starting), when I'm feeling down. I just ordered a copy of Kicked Out. Also, do you know (off the top of your head?) of any organizations working specifically with this population? If the answer is yes, I might shoot you an email because the explanation of why I'm asking is a bit long for a blog comment post. And also out of place here. Ok, now I'm off to look at those NatGeo photos. But seriously, thanks. Great post. All the thinking on my end happening. Such a fantastic post, and so very true. I taught in juvenile corrections for a few years and books were like absolute gold to my students - it was amazing how quickly they all became really dedicated readers who couldn't bear to miss a turn at the library. And strangely enough, in a much less critical way, your last question relates to my post for tomorrow. I've found that I definitely escape into books whenever I'm going through something rough. Great post, and discussion! And I totally agree. I also didn't come from the most stellar of childhoods, and COMPLETELY relate to your escape into books. And I mean the imaginary escape of reading about different worlds, and the literal escape into my room, or basement, or where ever, curled up with my latest book of the moment. I agree, that limiting access to books, limits a lot more than just the books themselves. Great thoughts, and thanks so much for sharing! This post grabbed me by the feels and yanked me around for a bit. 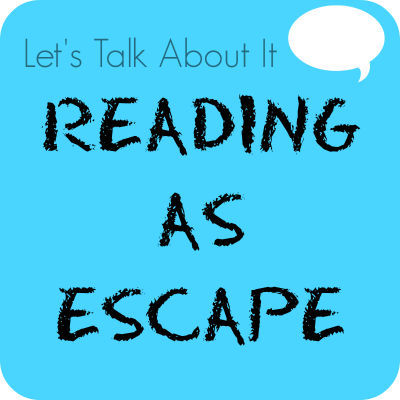 Have I ever used books to escape a hard time/situation? Yes x 10. Sure, like you mentioned, there are people out there who have had a considerably harder life, but that doesn't mean out struggles weren't exactly that. Most of my life has not been rainbows and butterflies. While I've also never been truly homeless, I've moved from one place to another every 6 months to 3 years of my life, and as a teenager I was put in a foster home, and then when that didn't work out (which is an understatement), I was moved to one juvenile group home and then to another. I had nothing but a trash bag full of clothes. Having access to books probably saved my life. It's sometimes easy to "forget" that since my adult life while certainly not struggle free, has been considerably easier. That's probably because I have much more control over my life. To say that 8 years in the Army was easier than most of my childhood seems crazy to even me, but it's true. However, books helped keep me sane during those years as well and held the loneliness at bay during my first couple years of college. Isn't it interesting how we sometimes want to match our moods/current experiences with our reading? I guess we either want to amplify the good when we're happy or distract ourselves when we're sad. I certainly don't do it all the time (sometimes I really need light reads when things are crazy around me), but it's a real thing. I'm glad you enjoyed the post! My internship in college really opened my eyes to how big a problem homelessness (and youth homelessness, in particular) continues to be. I do, actually! The Night Ministry in Chicago does work with homeless/runaway LGBTQ youth. I don't know a ton beyond that, but feel free to message me! Thanks so much for commenting. I'm glad I gave you some things to think about! I feel like I know this about you (your past teaching experience) but always seem to forget. I'm so glad you helped get them access to books! "Limiting access to books limits a lot more than just the books themselves"—you put that so brilliantly! It cuts people off from understanding that there are other worlds, other options, other outcomes than the ones they're currently experiencing. It cuts people off from hope. I'm so sad to hear that your childhood was rough, too, but I'm glad that books gave you relief. It took me a long time to acknowledge that I DID struggle in childhood—my own tendency to minimize my problems and my family's blind eye to some of the bigger issues made me very reluctant to say that things had been hard. It took me until leaving college and finding a good psychologist to begin to face these facts and work through them. I'm glad that you, too, are able to call your experiences like you see them, even if it can be easy to forget what you went through. Your childhood and adolescence sounds like it was all sorts of unstable, and I'm so sorry you had to go through it alone. It's great that you feel more in control of your life now, and I'm happy that you at least had books for comfort back then. What a beautifully written post. I'm so sorry you had such struggles when you were younger. I can't pinpoint a specific time or event but I have always used reading as an escape, even if just from my own mind. I agree about books being a necessity not a luxury even for the homeless. Yes, survival is paramount but the mind needs to be nourished almost as much as the body. Thankfully, I've always lived in areas with supportive libraries. Yes, it can get tricky but you don't need a library or id card to come in, sit down, and read the paper, a magazine, or a book. And when I was a librarian no one was ever turned away. Thanks—I'm glad you enjoyed it! It's fantastic to hear that your libraries are open and accommodating. I can only imagine what that must mean to people in your community looking for a safe place or a break from the norm.